Here is an example of the strange, red lines that I mentioned in the video. I found them disturbing, but cannot fully explain why. They just felt wrong. 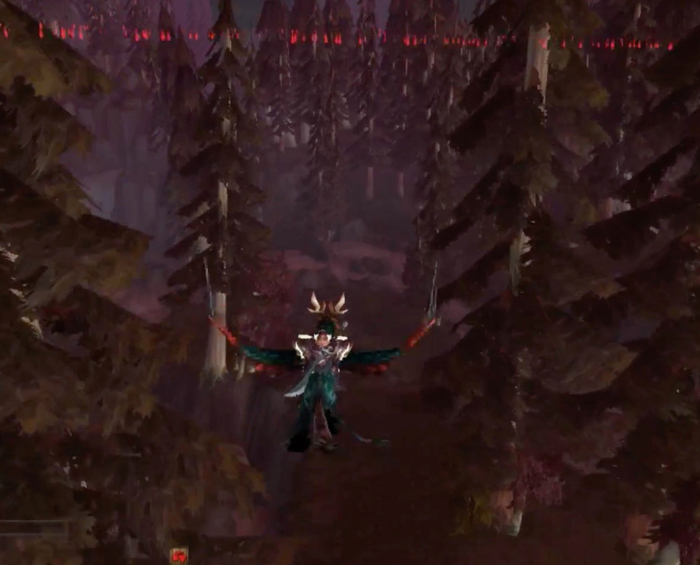 I kept getting distracted by these red lines hovering over the landscape while I was playing through the Battle for Lordaeron. It is pretty obvious that those lines are not supposed to be here. I’ve reported it as a bug, and figure that other players have, too. Hopefully, these bizarre red lines will be removed before this expansion launches. High Overlord Saurfang is somewhere in the middle of that mob. I’ll leave you to watch the video above to see what happens with him. 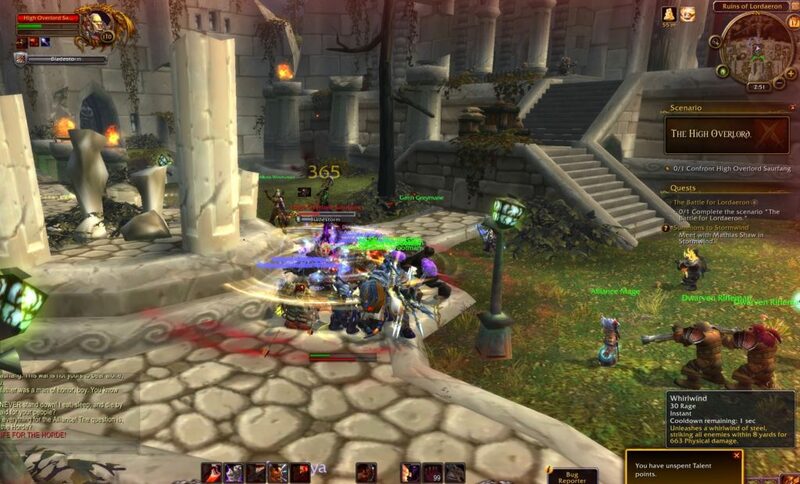 Without giving too much away, I will say that part of his story continues for Horde players. Saurfang pops up in the Stormwind Stockade, and has something to say. 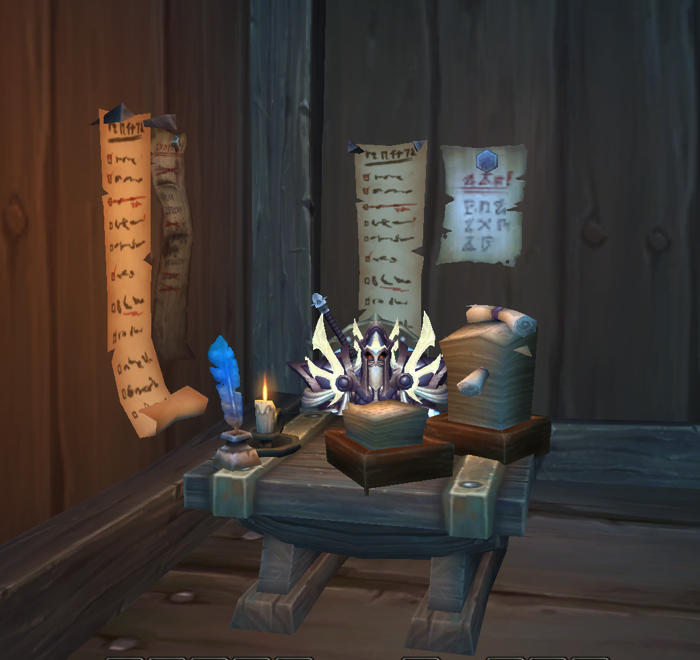 As far as I can tell, only Horde players will get that part of the story (because it comes up during a series of quests that follow the Battle for Lordaeron on the Horde side). 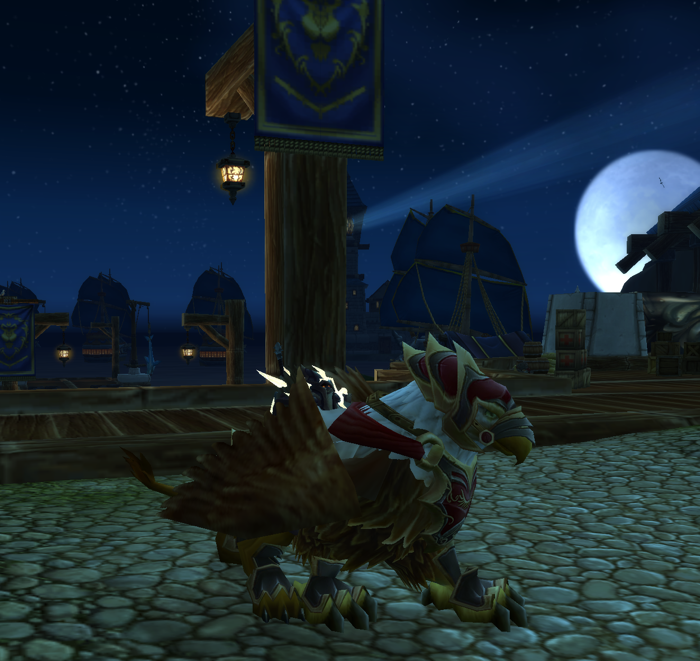 This lovely mount is called a Swift Red Gryphon. 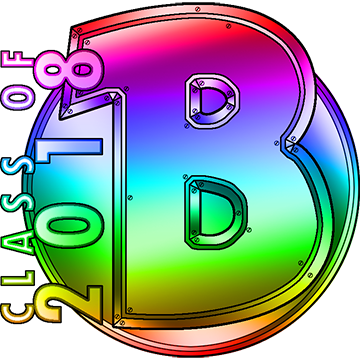 I had one of these on my Horde character during the Battle for Azeroth beta. This mount flies in Stormwind, but would not fly in some of the new areas of the Horde side. 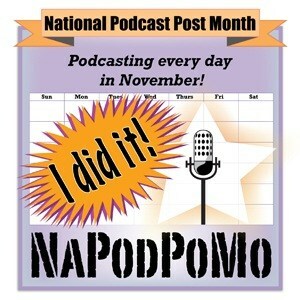 This does not surprise me. I figure there are probably new flying skills to purchase before characters can fly in new Battle for Azeroth zones. Shortly after this point in the Beta, I decided to try and get to Silithus so I could work on some quests that required me to travel to that zone. The flight master could not send me there – because I was on the wrong continent. 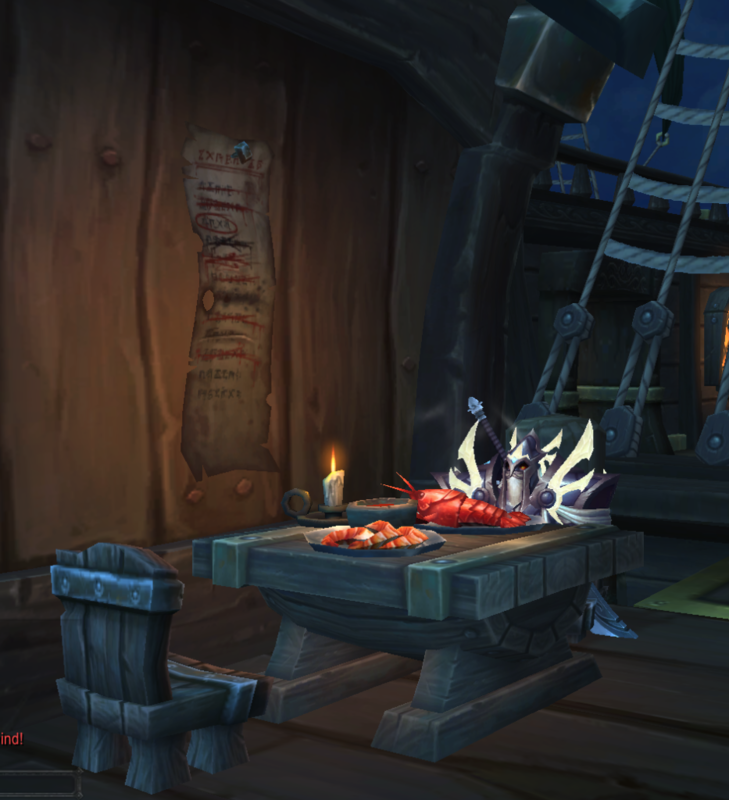 So, I flew across Stormwind, got on a boat – and discovered a bug. Later, I learned that I had selected the wrong boat. 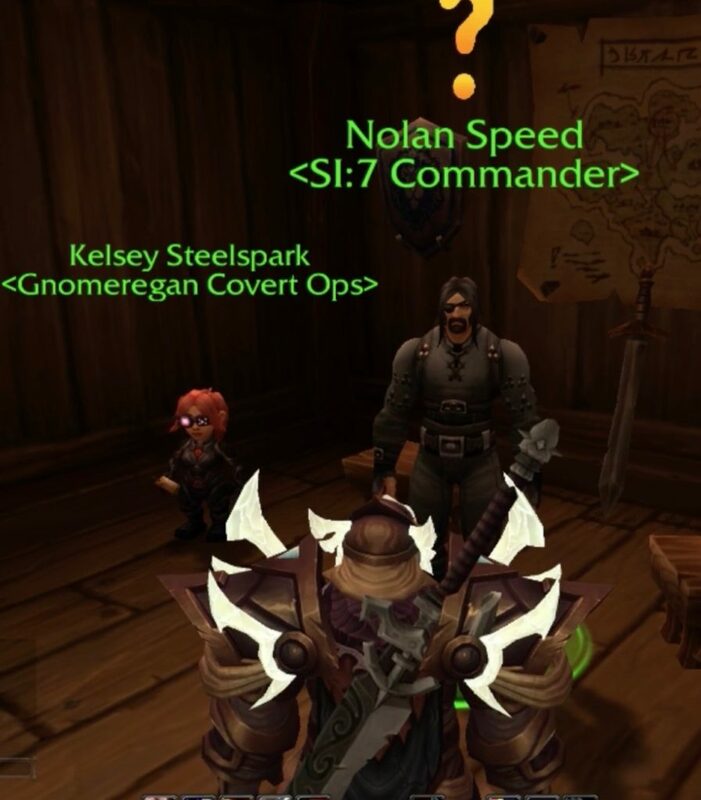 Thelgarn the Warrior ended up in Kul Tiras – which clearly was not the right place. It wasn’t even the right continent. He quickly found some dinner, and then started exploring. 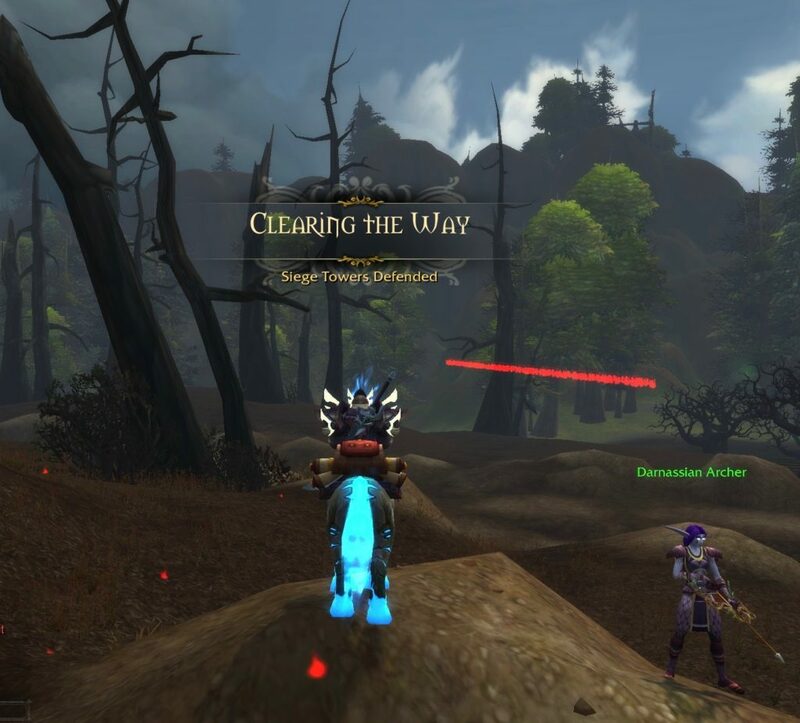 I’d already been through some of this when during the Battle for Azeroth Alpha. New things had been added since then. Eventually, Thelgarn decided he had enough of Kul Tiras. He tried to find the boat that brought him here, but it left before he could get on. This gave him some time to look all official by sitting at this desk. 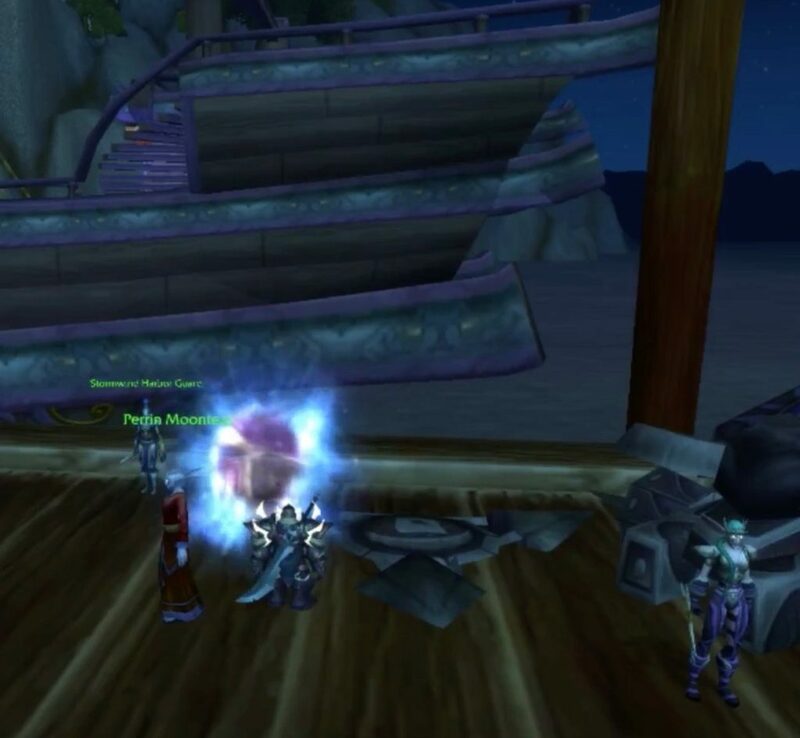 In this video, after waiting around for a boat that was taking a long time to arrive, Thelgarn remembered he could just hearth back to Stormwind and start over. A group of players was fighting a Target Dummy, who appears to be throwing Rubik’s Cubes. I’m guessing that the cube is a temporary stand in for something else that, for whatever reason, was not added to the Battle for Azeroth Beta. It turned out that Thelgarn was supposed to take this portal to Darnassus. I assumed that the boat all the way at the end of the row was the one that went to Kalimdor. It appears that is not so in the Battle for Azeroth Beta. Thelgarn ended up standing on a rock near the shoreline, which felt kind of random. But, I guess a portal can be set to pretty much anywhere in Azeroth. So… whatever. My biggest frustration with the Alliance side of the Battle for Azeroth is that the quest chains do not flow. 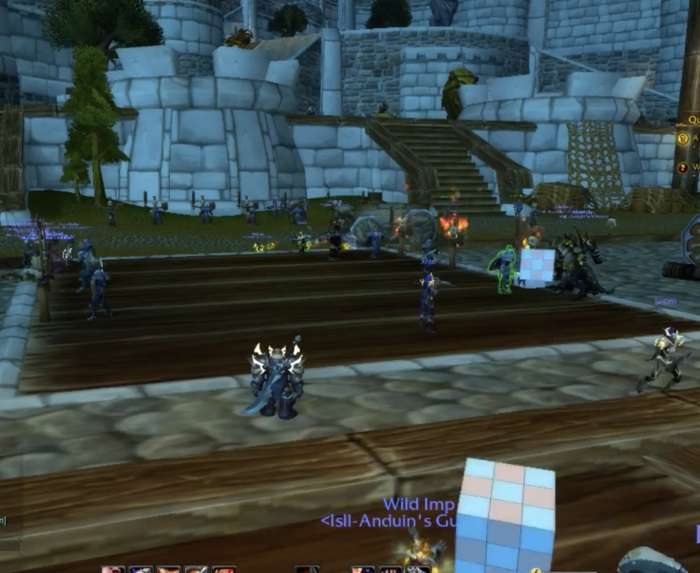 Start in Stormwind – queue for Battle for Lorderon. Hang around until it suddenly becomes your turn to participate. Finish the battle, and end up back in Stormwind. Find a quest giver (or two) who want you to go to Silithus. But, before you can do that, you are supposed to speak with King Anduin. This involves watching a cinematic of the King giving a speech and talking with two (important) NPCs while the player…. waits and watches. I had some confusion about how to get to Kalimdor, but that could be my own fault. It is reasonable to assume that players would just understand that they were supposed to use the portal. Arrive in Darnassas, standing on a rock. Take what feels like a very long flight from the nearest Flight Trainer to Silithus. This is kind of a fuzzy screenshot, in part because my character was in flight, and also because the whole area is a strange, pink, tone. The disturbing red line in the sky is back. I reported it as a bug. 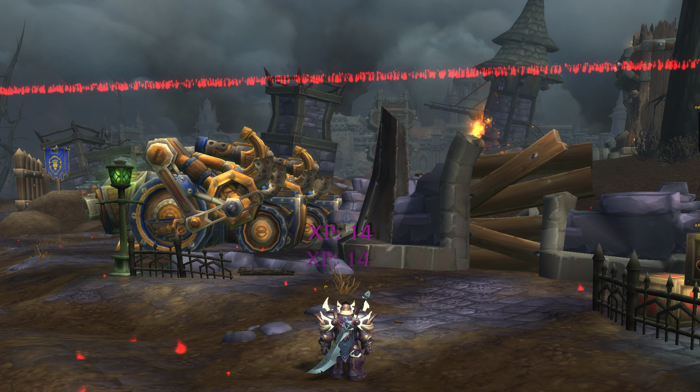 I’ve no idea why I see these red lines on the Alliance side, but didn’t see any of them on the Horde side. 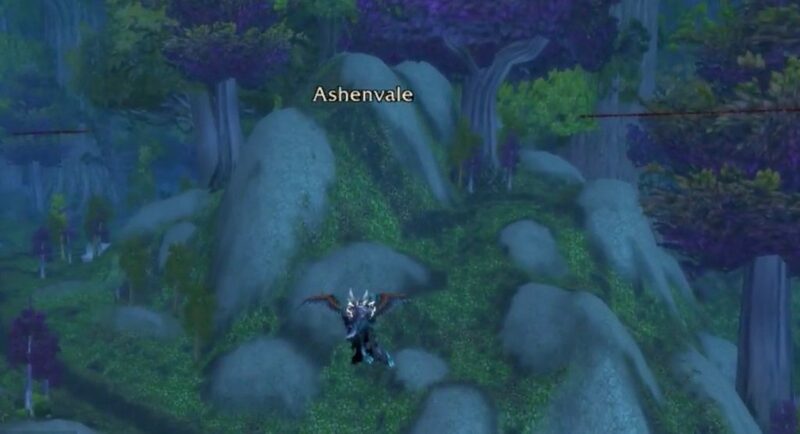 The red lines in the air became purple lines in the air somewhere around Ashenvale. Pick up a few more quests in Silitus. Complete some, turn them in, get a few more. One of the quests involves killing goblins to obtain Mysterious Ore, and another asks the player to put explosives on some Shredders. These quests were fun, and fairly easy to do. Oh, wait! I was supposed to speak with Magni who just so happens to be on the other side of the same area I’m working on quests in. Speak with Magni, and you take a … I’m gonna call it a “waypoint”… to somewhere. Once there, you watch a cinematic that explains how Azeroth got wounded. To me, it felt like players must do this to complete that part of a quest. Talk to Magni, do a little quest, and get the super important amulet. Magni says to take the … waypoint… back. I assume this means back outside this special chamber. But, no. 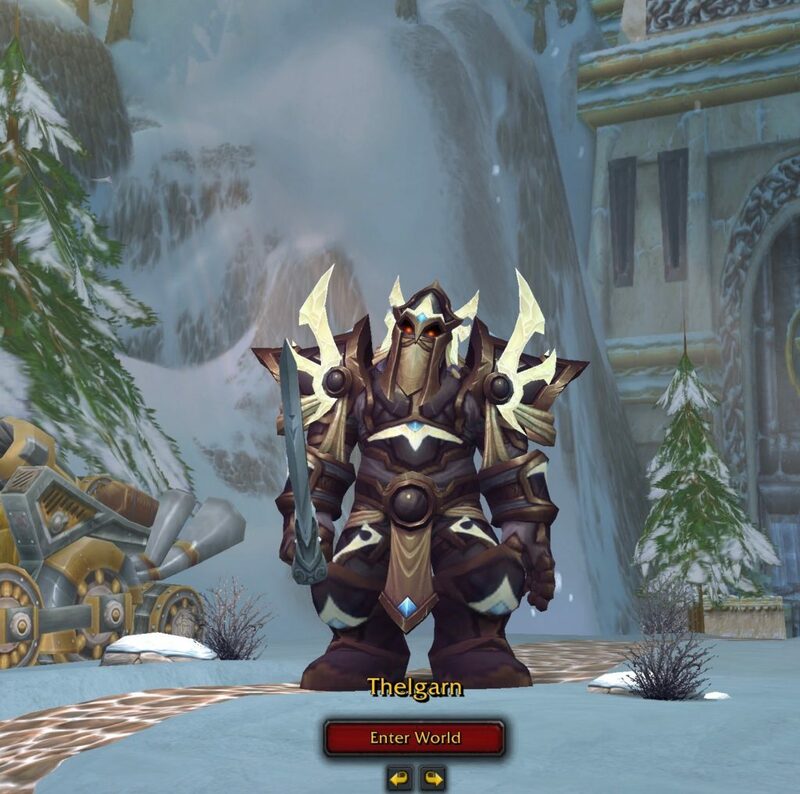 Thelgarn suddenly found himself back in Stormwind, with a quest to go see King Anduin. I had two quests in Silithus that I hadn’t started yet, and will now have to take the long flight back out there in order to complete them. It just doesn’t flow. This is disappointing because the Horde side of the Battle for Azeroth Beta flows really well. Obviously, things can change between now, and when the Battle for Azeroth expansion is released. I’m doing my part and reporting all the bugs that I find in the Beta (as I did in the Alpha). Overall, I think I will enjoy this new expansion, but might be focusing on my Horde characters a bit more than my Alliance ones for the Battle for Azeroth content. 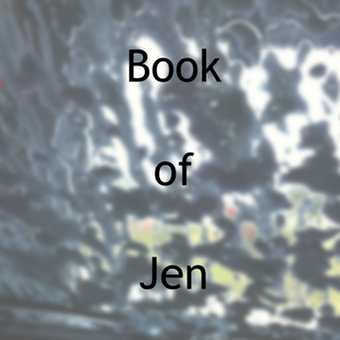 World of Warcraft: Battle for Azeroth – Alliance Side is a post written by Jen Thorpe on Book of Jen and is not allowed to be copied to other sites.